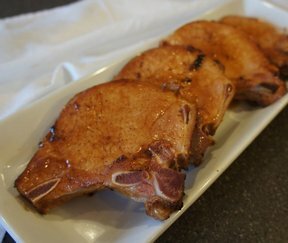 First, season your pork chops to taste. 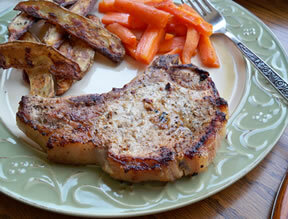 Mix flour, 1 teaspoon salt, 1 teaspoon pepper and 1 teaspoon garlic powder in a dish and dredge pork chops, coating well. Heat cooking oil to medium and brown chops in frying pan to golden brown, about 3-4 minutes per side. In a bowl, dissolve beef bouillon cubes with boiling water. In your crock pot, add mushroom soup. Stir in beef broth and chicken broth. Add pork chops. In frying pan that you browned chops, sauté mushrooms and onions, about 5-6 minutes. Top pork chops with onions and mushrooms. Cover and cook on low for 5-7 hours (depending on how hot your crock pot cooks). Preheat oven to 200-degrees. After chops have cooked, transfer to oven to keep warm. In a small bowl, blend 2 tablespoons flour with sour cream. Gradually whisk into meat juices. Turn crock pot to high for 15-30 minutes, or until sauce is slightly thickened. 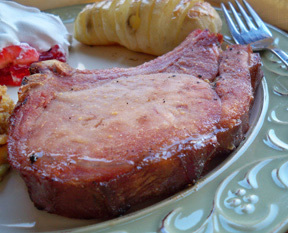 Serve over pork chops along with egg noodles.